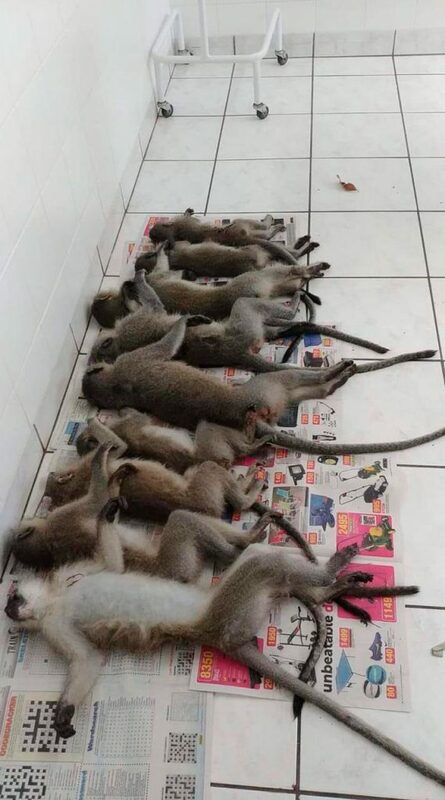 13 Vervet Monkeys and a dog have been killed in uMdloti, North of Durban after eating food laced with Aldicarb, leaving animal lovers shocked and outraged at the heinous act. A reward of R40 000 for information was offered by the uMdloti community, but according to reports a suspect and a witness have apparently been located by a private investigator. However, the community continues to appeal for information for swift justice after the troop of monkeys were poisoned, fearing that such an incident must not be repeated. Steve Smit of Monkey Helpline, said nine other monkeys which were poisoned are being treated by a Durban North vet. “My mind is consumed by the relentless thoughts of the kind of retribution I want to visit upon the monster. The Vervet Monkeys were attracted to the food which was placed before them in South Beach Road and Sixth Avenue in uMdloti, unaware that it was laced with poison. A cruel person who has a hatred for monkeys is in the midst. Six baby monkeys have been left orphaned. A dog died after it ate the monkey’s vomit,” said Smit. Two Riverside Veterinary Clinic vets, Dr Kerry Easson, and Dr Elsa van Biljon, have become the heroines in this sad saga. Easson, on hearing about the plight of the poisoned monkeys, worked on her day off on Saturday while Van Biljon, worked an extra shift to save the lives of the ill animals. According to Easson, the highly toxic poison, Aldicarb, also known as “Two Step”, may have been used by the killer. After tasting the food, the monkeys were stricken with diarrhoea and other complications. Simth commended them and the other people who did their bit to rescue and transport the animals to the clinic. If you have any further info on anyone harming monkeys, you can contact Marshall Security using the WhatsApp line (079 514 8352) or by calling 086 162 7732. 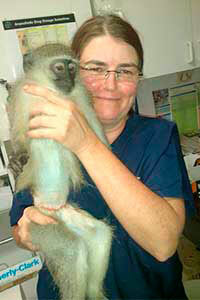 If you would like to donate towards the monkeys’ medical bill, you can visit www.monkeyhelpline.co.za. 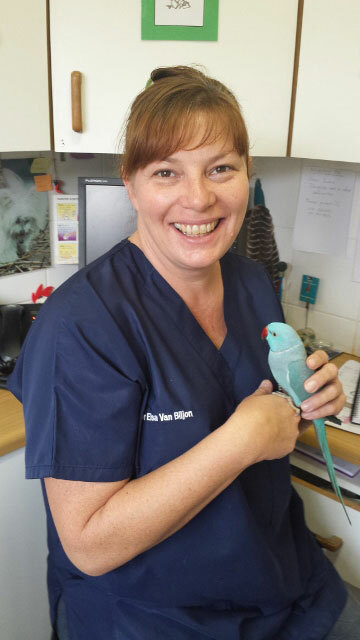 Alternatively, you can contact Riverside Vet on 031 563 6565. Umdloti residents can also make a donation via the eMdloti/uMdloti UIP.